Come and participate in one of the most amazing experiences: an ability to worship the God of Creation on the rim of one of his most magnificent creations, the Grand Canyon! If you are planning a summer vacation to the Grand Canyon-South Rim, please make plans to join us for an interdenominational sunset worship service on the rim, sponsored by “A Christian Ministry in the National Parks” (ACMNP). Each service is about 30 minutes long and includes singing of hymns and contemporary worship, Scripture reading, a brief message, and an offering. The West Rim Worship Site is located 300 yards west of the Hermit Road/Village Transfer Shuttle Depot along the paved Rim Trail. It is only about a 15 minute walk from Maswick Lodge and El Tovar Hotel, and a 10 minute walk from Bright Angel Lodge. 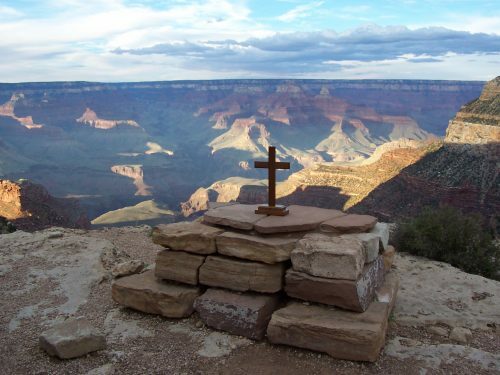 The Worship Site is identifiable by a large stone altar directly overlooking the rim of the Grand Canyon. These service times are also posted on signs located in the lobbies of all park hotels and lodges, the campground, and community bulletin boards near the Post Office. Concierges in the hotels and lodges also have the service times. Or call us at (928) 638-2340 for more information. Since 1953, Grand Canyon Community Church has partnered ACMNP to support college and seminary students who spend a summer working full-time in the park while providing relational ministry and worship services on the rim of the Grand Canyon and in the campground. Each summer, 14-18 ministry staff members come to the Grand Canyon to work full time in the park and minister to local residents and park visitors alike. If you are interested in coming to the Grand Canyon to provide ministry through ACMNP, click here for more information on how to apply.